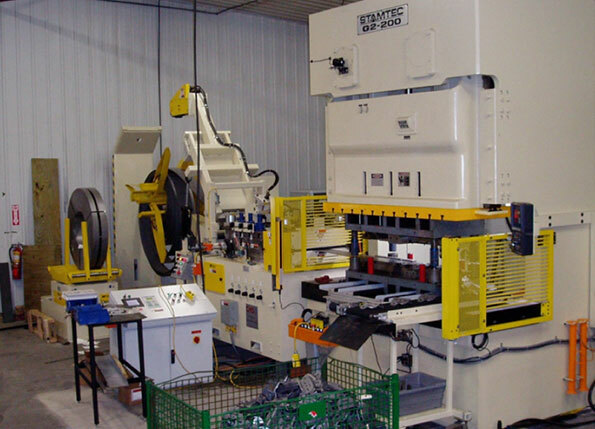 At Quality Stamping & Manufacturing in Morris, Minnesota, we produce precision parts, whether from blanking or forming, along with components fabricated from steel, as well as a range of other materials. We serve customers from many industries, from manufacturing to agriculture and technology. Our team of experienced operators is capable of meeting these clients’ diverse requirements with high-quality work and a fast turnaround—from one-time, short runs to standing orders of more than a million parts per year. Our flexibility, commitment to quality and efficiency make us a local business that is globally competitive. With 30+ years of experience, we offer in-house tooling capabilities, expertise in material selection and a depth of experience in product design. Our knowledge helps us save our clients time and money. We can often find a progressive stamping alternative for fabricated parts, saving time and material cost. Here is just one example of how we put our quality control process to work. When we run a part through production, we use a quality control sheet that lists various dimensions that are critical to the part. We take measurements at specific intervals (e.g., 100, 200, 250, etc.) during production to ensure that those parts are within tolerance. If we find one part out of tolerance, we go through all parts in the most recent batch. We remove all of those that are out of tolerance and run additional parts that fit the required specs. There’s a reason we put “quality” in our name. Quality is the foundation on which we lay everything we say and do. Reach out to our team to learn more. To talk with us about quality control or our stamping process, please call us at 320-589-1903. You may also fill out our online form to request your free quote today.